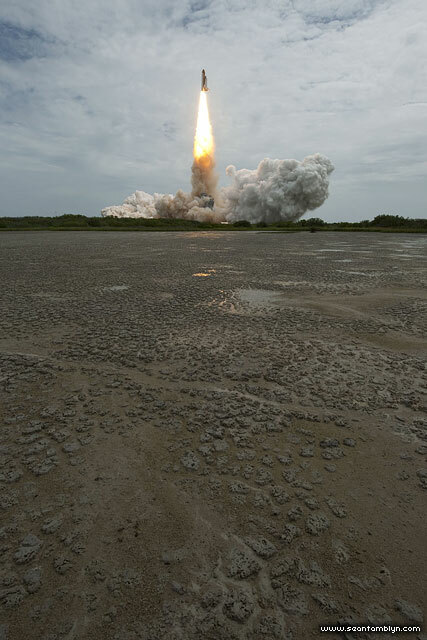 A remote camera set up on a dry lake bed captures space shuttle Atlantis clearing the tower during launch of STS-135. Heavy rains preceding launch day dramatically changed the nature of this photograph, turning the foreground from a brilliant landscape of caked and broken earth to something approaching a mudbowl. This entry was posted on Thursday, February 16th, 2012 at 5:34 pm. It is filed under Areas, STS-135 Atlantis, The Space Shuttle Project and tagged with Nikon 14-24mm f/2.8G ED AF-S, Nikon D700, PClix LT. You can follow any responses to this entry through the RSS 2.0 feed.